Seagate is shipping the 2nd generation Momentus XT Solid State Hybrid HDD. We wanted to know if it was faster than the 1st generation Hybrid HDD. And we also wanted to know how it compares to a 'normal' HDD as well as a "pure" solid state drive. 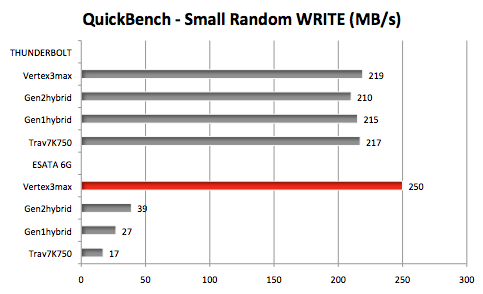 We tested all four permutations using both Thunderbolt and 6G/s eSATA interfaces. 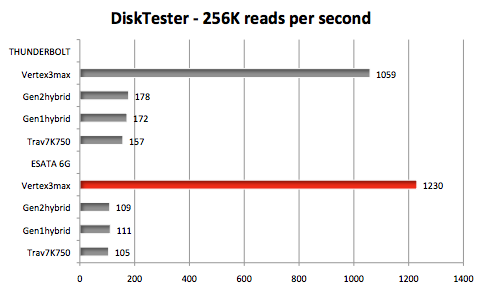 Using the "run-random" test in the Terminal based version of DiskTester with a 256K test size, we were able to measure how many reads and writes the various drives perform per second. 1. Though slightly faster than a "plain" HDD, the Seagate Momentus XT Solid State Hybrid HDD can't hold a candle to a "pure" SSD. 2. At least according to our tests, the second generation 6Gb/s Seagate Hybrid HDD is only slightly faster than the first generation 3Gb/s Hybrid HDD. 3. The random transfers by HDDs in the Thunderbolt portion of the first two graphs were surprisingly high matching the SSD. Yet they only exhibited this behavior when we used the Promise Utility to initialize the drives. If you set them to PassThru mode and format them with Apple Disk Utility, the random transfer speeds drop to what we saw with the eSATA interface. Nor does this behavior appear when we ran the HDDs in the LaCie LBD Thunderbolt. So there is some "ooga booga" going on with the Promise Utility and Pegasus Thunderbolt enclosure. 4. According to the manufacturer specs, the Hybrid HDD uses consumes twice as many watts at idle than the Hitachi HDD and draws 33% more when active. 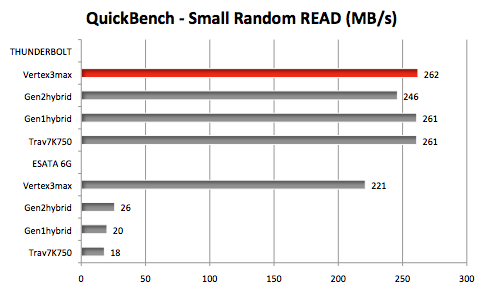 However, both HDDs have lower power usage ratings than the OCZ Vertex 3 SSD. Storage Review has posted a review of the gen 2 Seagate Momentus XT Solid State Hybrid drive. They compare it to gen 1 Seagate Hybrid HDD as well as four 'normal' HDDs. 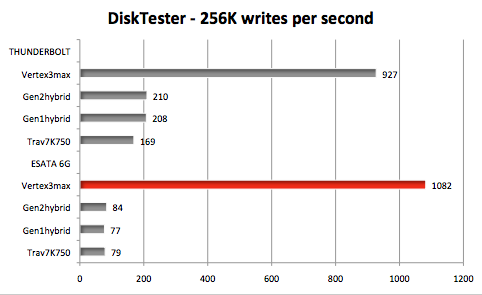 They include an IOMETER test that shows the Hybrid HDD performing twice as many I/Os Per Second as the fastest 'normal' HDDs. However, the OCZ Vertex 3 max IOPS SSD they tested in a separate review performed 280 times as many I/Os Per Second as the gen 2 Hybrid. 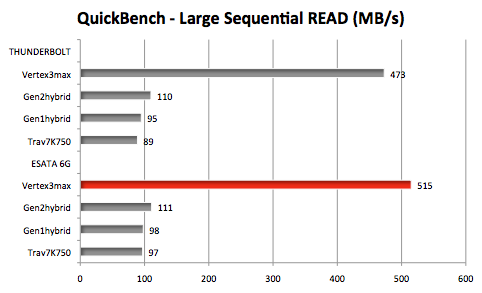 HardOCP explains why you should spend the extra $$$ for the "pro" SSDs with Synchronous NAND. Storage Review compares the advantages and disadvantages of HDD versus SSD. 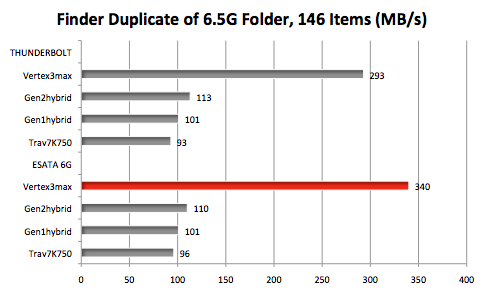 Storage Review rates the best HDDs (including hybrids) and SSDs (updated 12/7/11). 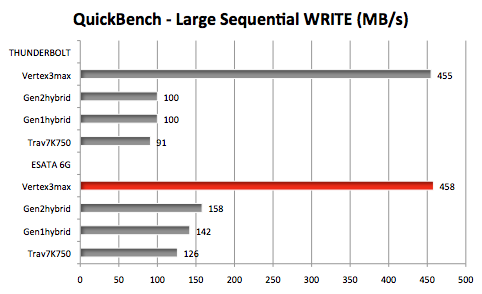 We plan to follow up with some test results for dual Hybrid HDD RAID 0 set in the LaCie LBD Thunderbolt. To be notified of new test results, subscribe to our RSS feed or follow us on Twitter@barefeats. If you have a question, comment, or want to volunteer as a remote mad scientist, . The Apple Store USA online store takes orders for various Macs and for the Promise Pegasus R4 and the LaCie Little Big Disk Thunderbolt enclosures. Clicking our links or Apple banners is a great way to support Bare Feats since we earn a commission on each click-through that results in a sale.